You'll have some announcements for the conference. Dates, the place, new website, call for papers announcement, hotels that visitors can stay, schedule, keynote speakers etc. Usually, every open source project has a central blog or news site. You can write the articles there. Try to make fuzz by publishing your articles often. Two things you want to have is contributors+visitors and sponsors. If your project is famous, then it's easy. If not, then you better publish the initial announcement to magazines, newspapers, technical blogs-sites. If you don't have access, then you better send it by e-mail or fax and then call them and ask them if they got the text. If they publish it, you're lucky. Translate those announcements and publish them, so local population will see that there's a conference coming. * Community (local or global) has to apply for a booth and/or, if it's possible, present why someone should attend. * Another cool thing is to have free coupons for beer at the conference. If beer isn't the solution, then find another thing that can be found only at your conference and give free coupons. * Wear special T-Shirts with the logo or #oSC or "Ask me for the conference". You show people that you're organizing something and can ask you questions. * Finally, go to other project's booth and invite them. You can ask them if they want to have a booth at your conference or apply for a presentation. Create a list of messages you'll post to social media. When you have the schedule ready, create a post with the name of the person (mention him/her on the social media), the title of the presentation (mention if it's a famous project). The same account can create the Lanyard event (you'll see next). Create a Facebook event page under the official account of the project. Post the tweets here as well. Post the messages (no 2). If you have some cool documentation of the subject that will be presented, just post it. Since the address will be difficult to remember, create a subdomain under your project's name (eg facebook.conference.opensuse.org) that will forward it to the event page. Do the same as facebook. Some people hate to use facebook, so google plus is the solution. Do the same also with the URL. Google Plus event notifies to e-mail every user about changes. So if you post, they'll get a notification. This isn't very famous but it's very cool. It uses twitter accounts. You setup the event and when you have the schedule, you can add the subject and mention the speaker. You can also use it to post announcements. You have to create an IRC channel where you reply all possible questions. There's also mailing list for that. To promote the conference, you should post the announcement to mailing lists, forum of all possible projects (eg if we're oprnSUSE, then post to GNOME, KDE, ownCloud etc). And try to inform the posts with the new announcements. Create a group where people can upload their pictures, so everyone who blogs can use those pictures. You can create it before the event starts and post picture from the venue, before you set it up. Create a table. Columns will be the rooms, rows will be the timetable. So you'll check the time and post the right one. WARNING: Check with program team if there was a day change of the program. Also check the right Stream URL. Here you start posting the messages per time. Don't forget the mentions to people, projects and the #. Here you mention someone by using @username. Ask people upload pictures here. Also ask people to post their reports. Same as Twitter, don't forget to mention. Here mention is with +Project name. Here you can use more characters that twitter. 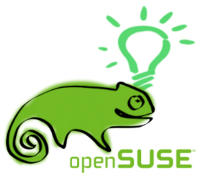 So here you can also add the hashtag of your project (eg #opensuse, #opensuseconf). Again, ask people to upload pictures here. Also ask people to post their reports. You can post here as well. Some people didn't join you or they just see live streaming and use IRC to ask the speaker. So it'll be nice if theres the program of what's in every room with the streaming URL. The social media guy is responsible to handle all the above. He checks if the streaming is working and if not, then warns the video team. It's good for him because he can see all presentations but it's kind of "I'm locked somewhere and I don't mingle with people". Users who didn't make it, they can see the conference over the Interent. Try to gather all pictures and upload them in the afternoon, so everyone who wants to blog, can use the pictures from there (there are Google Plus and Facebook events as alternatives). It's very cool if the pictures are up very soon, so everyone can view them.